When it comes to baby carriers, I didn't realize until recently just how many different versions I've tried. Back in the day when I was pregnant with Big Sister E, I bought one of the well-known ones that everyone seemed to have and we ended up getting some use out of it. I say some only because she was a big baby (you'd call 10 lbs 5 oz a tad big, wouldn't you?) and after a while my shoulders had a hard time taking the weight of having her strapped to the front of me. As that carrier wasn't one that could be used any other way, little by little it ended up staying in the closet more while the stroller went on more trips. With Little Sister B, I was more focused on finding a carrier that I really liked (and could wear longer) because I knew I would have a 2-year-old to chase around while holding my newborn. From wraps to slings to framed backpacks, I had at least one of each. They all had their pros and their cons and it would have been nice to take a little bit of one and combine it with a little bit of another. Had I done that, I might have ended up with the EcoSash Wrap & Tie Carrier from Infantino. 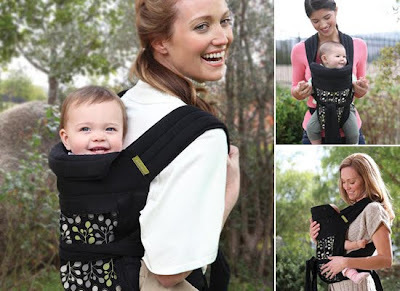 Designed with style and comfort in mind, the EcoSash Wrap & Tie Carrier has a natural, form-fitting design that is easily adjustable for both the parent and the baby. Suited for 8 - 35 pounds, this Wrap can be worn in the three most commonly-used carrying positions (facing in, facing out and backpack) and the ties make it possible to fit just right every single time. Not even out of the package and I liked the fact that the EcoSash comes with its own Mesh Washing Machine Bag, which is great both for cleaning and for storage. 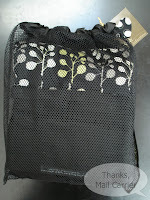 All of my past carriers ended up strewn around the house or tossed on hooks, but the EcoSash can be placed right back in the provided bag to keep things organized. 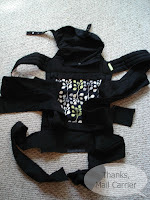 As with many of the wraps and slings that I have used, there was a moment of confusion looking at the various straps and pieces and wondering where in the world they were going to go when it came time to put this on. However, having watched Infantino's YouTube video beforehand, I was already familiar with where and how to start. Unfortunately, Little Sister B has decided that she is far too big and independent to be carried anywhere and was extremely vocal that she wanted no part in testing out this Carrier (even though she would have easily still fit in it comfortably). However, that didn't stop me from trying it on in all three positions to get a good idea of how it would really work. What I found (after marveling at how soft the fabric was) was that for both of the front carry positions, the concept of tossing the wide, padded straps over my shoulders and then bringing them back around to tie seemed much more difficult than it really was. I was able to simply hold onto the front portion while maneuvering one strap and then the other around the side, through the holding loop and tie them in the front. To get a better idea of the look, comfort and accessibility, I enlisted my ever-patient husband to try on the EcoSash Wrap & Tie Carrier as well. Did I mention my husband's high patience level and that he puts up with a lot? Having found a test subject that was happy to participate, I did find that the first time I got my husband and Bear situated that I had forgotten to run the strap through the loop on the front - but that was likely due to trying to hurry for his sake. In the end, being able to adjust the EcoSash to fit them both perfectly was easy to do and they would have been ready to head out in comfort and style. When it came time to switch to the back carrying position, it was definitely a two-person job. I think that down the line, after a lot of practice and with a baby old enough to know what is going on, this could be done alone possibly by starting out sitting down. However, for our purposes, I simply wove the straps through the loops to create large loops (similar to those of an actual backpack) and my husband was able to slip this right on. Tucking Bear safely in, all that was left to do was bring the sashes around to the front and tie them securely. The look of the two double knots that remained in the front was a little odd at first, particularly with all of the extra fabric hanging down, but that seemed to be easily remedied with a few tucks here and there. Without having to deal with the hassle of buckles or slowly adjusting a strap bit by bit so that it fits correctly, the EcoSash easily fit both my husband and I well and was extremely comfortable. Added bonuses (seen below) like the detachable hood (great for when babies are sleeping or you just want to keep some sun away), reversible fabric print (the front patterned section can be flipped over to solid black), helpful instruction labels and reminders sewn on the underside of the straps and the handy bag for washing give this Carrier an edge up on the rest of the market. 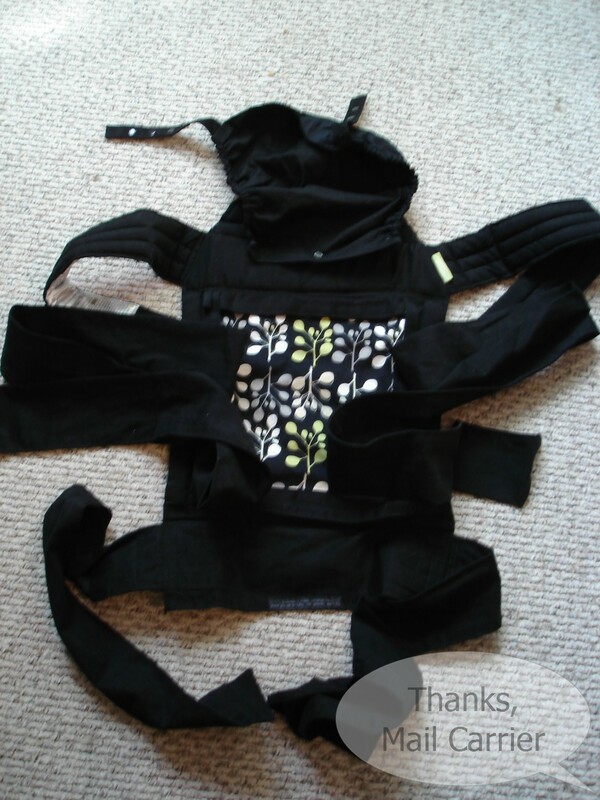 Combine these features with the great quality, adjustable fit, versatility of carry positions and the large weight range and I can see the EcoSash Carrier easily being used from infancy through toddlerhood. 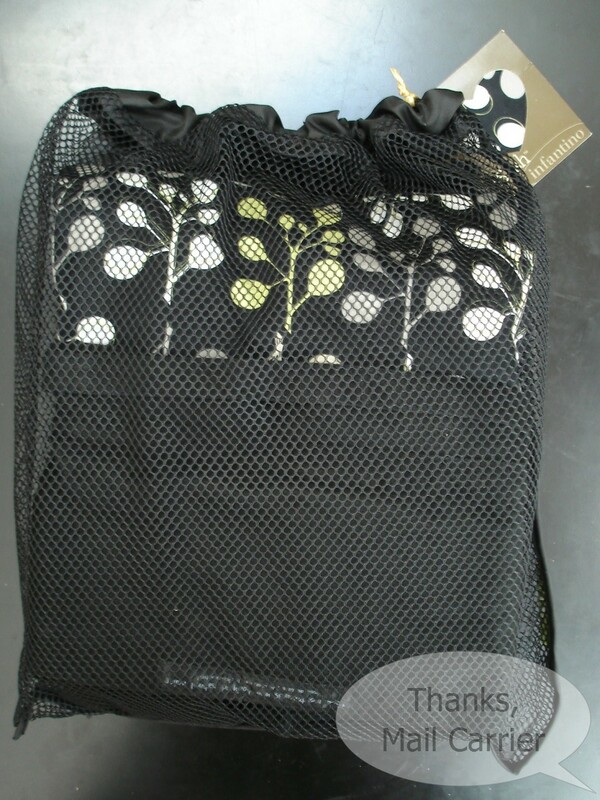 For more information and to check out the full line of stylish carriers that Infantino has to offer, visit their blog. Keep up to date with everything Infantino on Facebook, Twitter and YouTube as well. 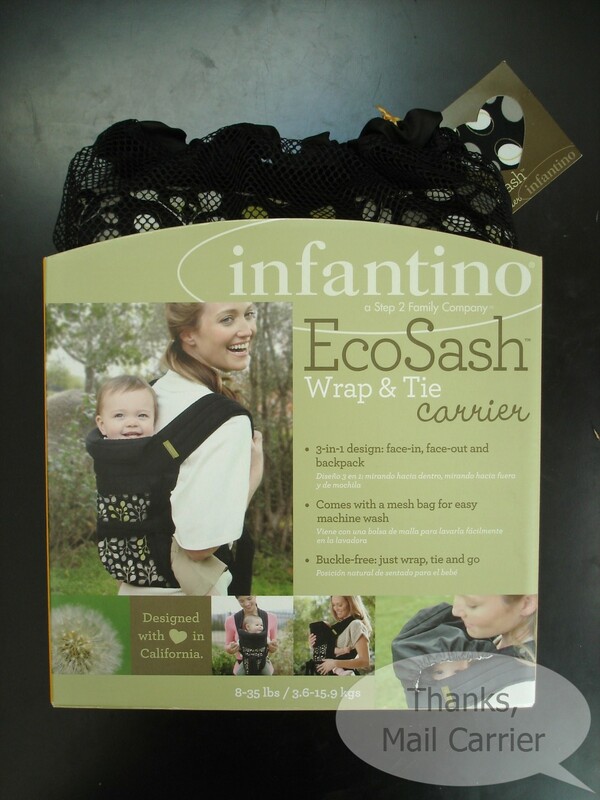 The EcoSash Wrap & Tie Carrier is available at Babies 'R Us for $59.99 but from now until September 21, you can receive $10 off of the EcoSash and the new Balance Carrier. Visit your local store for more information and availability. I am a participant in a Mom Central campaign for Infantino and have received various Infantino products as part of my participation. However, other than the products, I was not provided with anything or enticed to do this review in any way. This review is solely my honest opinion of this item.